Calling all drummers who want to improve their chops! Join fellow drummers for a clinic with Anadigi's resident drummer Raf Soundwalker. 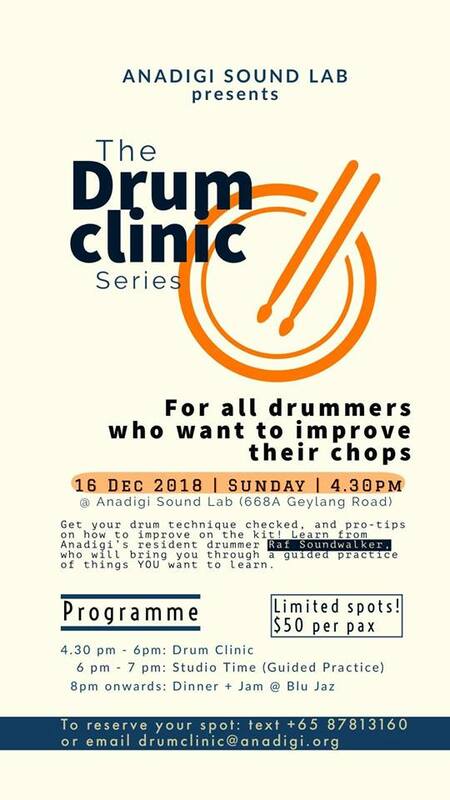 Anadigi's resident drummer Raf Soundwalker will be hosting a drum clinic on 16 Dec 2018, 4.30pm @ Anadigi Sound Lab. The clinic will cover what YOU want to learn - from drum techniques, groove works, to effective practice habits on the drum pad and kit. Join fellow drummers for a tailored clinic session, guided practice, and dinner + jam in the evening @ Blu Jaz Cafe! Open to drummers of all levels. Limited space for this run, reserve a spot for you and your drummer friends today.